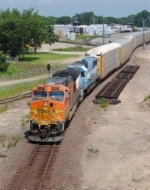 Description: What I'm guessing is the V-TACBLU departs from La Crosse with a GMTX (former Oakway) SD60! I never thought I'd see one of those again in MN. Title: Blue and White Lives! Description: Going away shot of the GMTX 9033 as it heads towards Chicago, I never thought I'd see blue and white on the BNSF again! Description: A familiar face sits at East Minneapolis after bringing in a the Triple Crown. Description: The aging SD60 should get the lead honors on the next train. Pretty neat. Description: NS Eastbound Freight Train 198 ( New Orleans, La. to Macon, Ga. ) passing through Lovick, Al. bound for Macon, Ga. Description: NS Westbound Loaded Rail Train 912 passing through Tallapoosa, GA. Description: NS Westbound loaded Rail Train 912 passing through Heflin, AL. Description: NS Southbound Freight Train 183 passing through 22nd Street Interlocking in Birmingham, AL. Description: GMTX ( Former Oakway Leasing/EMDX ) SD60s stored at Norris Yard in Irondale, Al.